After his farm became completely certified organic three decades ago, Jim Cochran had a thought: Why not certify employment practices the same way you certify farming practices? 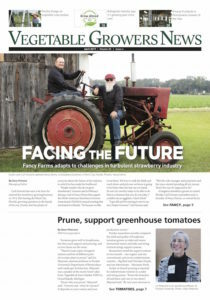 Cochran, owner of Swanton Berry Farm in Davenport, California, has been working toward that goal for decades. In 1998, he signed a contract with United Farm Workers, guaranteeing his employees things like health and dental insurance, vacation and holiday pay and pensions. He completed the circle last year, when his farm earned Food Justice Certification. Under the FJC program, he said a third party inspects his farm to make sure his employees are getting a square deal, while his farm gets recognition for going the extra mile. Cohen said there are two Food Justice Certified farms in California’s Bay Area (Swanton Berry Farm and Pie Ranch) and one in north Florida (The Family Garden), as well as a group of about 60 family scale grain farmers in Canada. Cochran said AJP isn’t just looking out for farmworkers. Farm employers benefit, too. in the marketplace. There’s always somebody willing to buy his produce now, which wasn’t always the case before. And with state- mandated minimum wage and overtime increases coming in the next few years, reliable buyers are more crucial than ever, he said. “It costs us more money to do business in California,” he said. “We’d like to get some recognition for that.” Retailers get recognition, too, for looking after the welfare of small farmers and their workers, Cochran said. Growing about 60 acres of vegetables, 14 acres of strawberries and 6 acres of caneberries – all certified organic – Cochran’s farm earns roughly $2 million in sales. He manages about 25 full-time employees, most of whom live in his labor camp year-round, he said. During FJC inspections, inspectors interview Cochran’s workers privately to find out if they’re treated and paid fairly. They examine his food safety practices. Like organic certification organizations, they want to see records to verify he’s complying with the law, he said. For employers, there are benefits to such a thorough inspection. It can highlight things they might have missed. For example, Cochran thought he had explained his health plan pretty well to his employees, but he was alarmed when FJC informed him that a few of his workers didn’t realize they had health insurance. “Maybe you’re not doing as good a job as you thought,” he said. Growers who want to learn more about the FJC label should start by getting in touch with AJP. They also should estimate how much using the label might cost them, Cochran said. Brown started The Family Garden in Bell, Florida, a decade ago, when his construction work was drying up and his garden was getting larger and larger. Several years later, the farm expanded to Gainesville. Between the two locations, there’s roughly 30 acres of certified organic vegetables, strawberries, melons, peaches and satsuma mandarins. The farm has a 265-member CSA, sells at a weekly farmers’ market and also sells to local restaurants, stores and distributors, he said. The FJC label has helped differentiate The Family Garden from similar farms in the area, but it still needs more market recognition – just like the organic label did 30 years ago. Hopefully, when more farms are Food Justice Certified, their prices will start going up, Brown said.